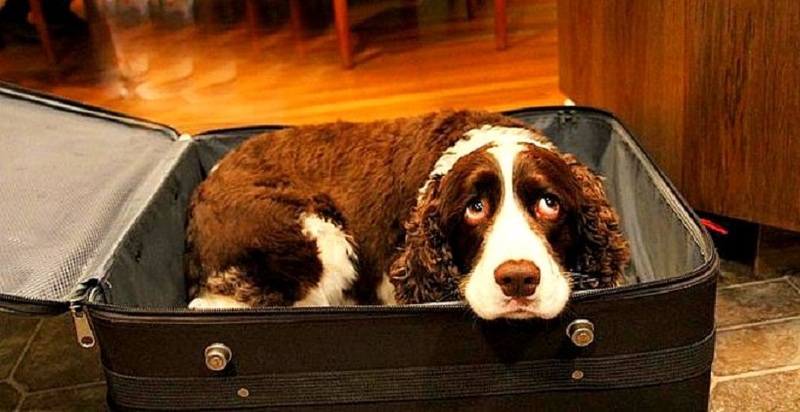 “Our dog is about a 50 pound Australian Shepherd, and as it turns out, she fits nicely in a normal suitcase. I packed her in, with the lid unzipped, and placed her in the car until we arrived at the hospital. When we arrived, I ‘explained’ to her that I would open the zipper in a few minutes and that she could see her Mommy. “Unbelievably, she never whimpered, barked, or whined. When I walked past the station nurses, I told them I was simply bringing items to make my wife more comfortable. No problem, they said. “When we entered the room, my wife was asleep. I unzipped the suitcase, and the dog immediately jumped on the bed, and gingerly laid across her chest, somehow avoiding the wires and IV. She positioned herself to where she could look directly into my wife’s eyes, and laid completely still, until about twenty minutes later, when my wife woke up, and started moaning in pain. “The dog immediately started licking her, and quietly moaned, as if knowing that barking would definitely blow our cover. My wife hugged her for almost an hour, smiling the whole time. We were busted by one nurse who was so touched that she promised not to tell. When my wife finally went back to sleep, I loaded the dog back in the suitcase, and she somewhat sheepishly obliged.